Duvid is unconcerned with this torrent of flim-flam obfuscation. He suggests Marcus, Silverstein and Postol should devote their investigative attentions not to warheads on the magnificent Iron Dome system but to those on Israel’s four dolphin class submarines, with two more due for delivery soon, each capable of carrying 16 torpedos with a range of 1,500 kilometres. NB. 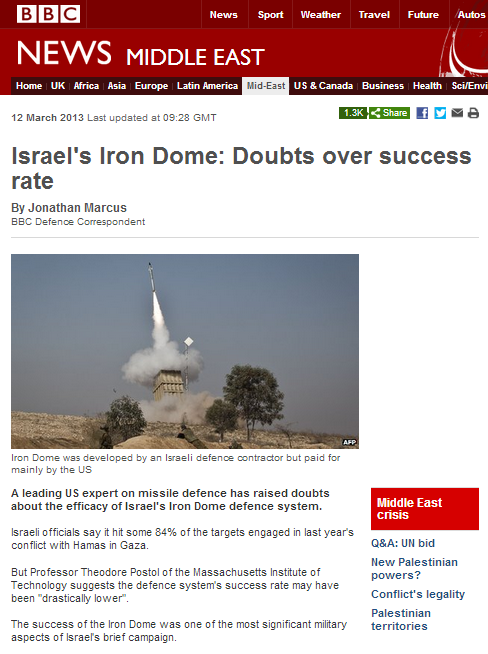 Duvidl also doubts Marcus’s baloney will affect interested Iron Dome buyers South Korea and Singapore. More likely, half the world will be queueing up to buy this ever-more-necessary life-saving IDF marvel. Postol called it the ID a miracle weapon system on the MIT site interview. Is he “all there” as the Brits say ? Excellently researched Hadar. When I read the Beeb article I rubbed my eyes in disbelief. I couldn’t understand how this Postol chap came to his conclusions when the Iron Dome was so closely studied in action during the war. I also didn’t understand (OK, maybe I did, a little) how the BBC swallowed his vague obfuscations about his research so easily. I guess if someone’s views fit one’s worldview so precisely, it’s easy. It would be the easiest thing in the world for them to pick up the phone to the Defence Ministry, but they would rather use sources that seek to defame Israel. 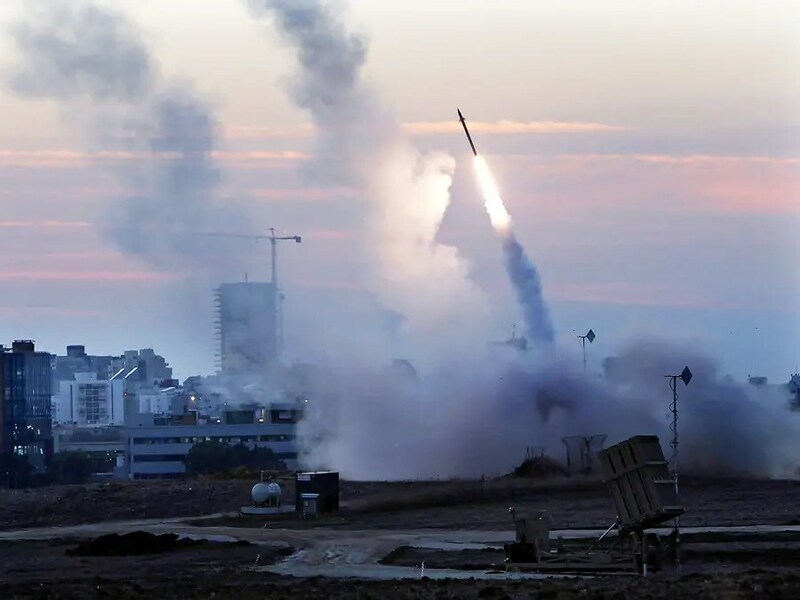 If Iron Dome failed to intercept those projectiles from Gaza, one presumes those projectiles would have landed somewhere. In the few case of reported failed interceptions, the IDF detected an impact and found the remains. Did that happen on those occasions that the IDF claimed were successful but Postol suggests were actually failures? Apparently not. I have to wonder if Postol’s thinking is constrained by thinking how a system would have to work to be successful, determining that it couldn’t be done, thus a priori Iron Dome can’t possibly be as successful as claimed. I really do think this is very poor “journalism” on your part. Mr Silverstein has nothing to do with our story and presumably you include his name to excite/incite your readers. The report on Ted Postol’s work (with two other scientists cited) first ran in Ha’aretz. I saw this but waited until I had a chance to speak to Postol – who despite your rather nasty insinuations, is a highly respected scientist with a distinguished track record in this field. You will remember that he correctly questioned the performance of the initial Patriot system in the war to liberate Kuwait. His concerns about Iron Dome certainly merits an airing rather than criticism. The BBC did eventually get a response from the Israeli MoD and I updated my piece to carry this. The original story carried a blander response from them. Come off it Jonathan. The BBC has enough ‘form’, WRT its coverage of Israel that when you put out a virtual rehashing of a story – almost a conspiracy theory – that is being offered up by such ‘friends,’ of Israel as Silverstein, then BBC Watch is entitled to take you to task. You can hardly work for an organisation that has acquired the poor reputation for balanced reporting as has the BBC, and expect your work not to come under deserved and forensic scrutiny. With colleagues such as Donnison, Bowen, Danahar et al, and with items such as the recent death of the BBC’s Gaza employee’s baby son, which your colleagues reported as being the fault of the IDF, when in fact the UN has categorically stated it was a misfiring rocket from within Gaza, and those self same colleagues refuse to apologise, backtrack or offer a retraction, then frankly, the ongoing smearing of Israel and the IDF by anyone at the BBC deserves a thorough scouring. If you want to know what balanced reporting is all about, watch Tim Marshall at Sky. He doesn’t always get it 100% right, but unlike the BBC, he does not appear to deliberately try to get it wrong, because he has ‘gone native’, something that very much seems to affect the ‘reporting’, of some of your colleagues. So please don’t worry yourself sick over US taxpayers’ money. Perhaps you could pay more attention to using UK taxpayers’ money more effectively in the BBC. Amen to that. In fact how about the BBC giving up the income from the licence fee and seeing if it can make it on its own merits. And I’m not the only person saying so. Tremendous article in the Commentator. Mr. Marcus – Tempting as it is to ‘homage’ how the BBC would respond to a licence fee payer expressing concerns based on what they ‘think’, and the height of dudgeon that would be mounted on claims of incitement (something the BBC clearly avoids in its ME ‘sources say’/’claimed photo’ coverage), I am intrigued that you think a national, for once actual purely defence system should be open to your expert investigation to explore possible weaknesses for foes to exploit, when your employers appear to impose FOI exclusions on near any aspect of the corporation’s activity mainly using blanket ‘For the purposes of journalism..’ or ‘commercial sensitivity’ excuses. Now I know Lord Patten has told you that only the BBC holds others to account, but why do you think the BBC should get to obfuscate on trivia while you expect to be told and/or ‘report’ upon based on what you fancy, based on ‘probables’, when lives are at stake? Good to see you responding here Mr. Marcus. Unfortunately the Ha’aretz article is subscription only so I can’t access it but it’s a great pity that the BBC habitually gravitates towards the left of the Israeli political spectrum to glean info for articles on the Israel-Arab conflict. Have a look at how often the BBC quotes Ha’aretz as opposed, for example, to the centre-right Jerusalem Post if you want to understand this aspect of the problem many people have with the BBC. There is a newish online paper, The Times of Israel, which appears to take the middle ground. It’s far prefarable to Ha-aretz, which is filled to the brim with alleged journalists jostling for position to see who can write the most subversive article attacking the status quo in Israel. OK, fair enough, you didn’t mention Silverstein in your article. But his blog is worth reading – not for his sneering attacks on the IDF and anyone else who doesn’t hold his views but for the comments. Those by Elad R are particularly interesting and comprehensive. I listen to you from time to time on the World Service, Mr. Marcus, and I should say hear that I don’t regard you as biased as many of colleagues, who never have a positive report on Israel or a negative report on the Palestinians. But the problem is that you find yourself within a culture at the BBC that is implacably biased against Israel. Even your Middle East ‘Editor’, Jeremy Bowen was recently admonished (with great reluctance) by the Trust for his anti-Israel bias. Noobody here is making anything up re BBC bias.